I was too quick concluding that the jalapeños from the garden I hung up for drying are not changing color – they are. On sunny days I put them out every morning, move them with the sun in the afternoon, and bring them in at night. That might sound quite involved but what wouldn’t I do for a good, homemade harissa? The harissa that comes in small cans like tomato paste or tubes is awful – it is nothing but hot. The real stuff for me is harissa berbère. It is based on sun-dried chilis and blended with garlic and spices. When I lived in Tunis, one of the highlights of my week was shopping at the Marché central on Saturdays. 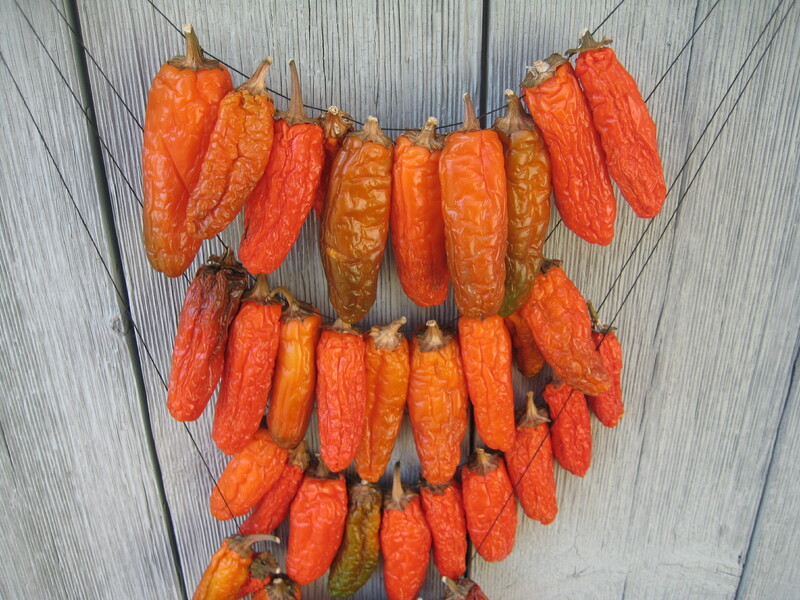 I would always buy a glob of harissa berbère, which was sold in bulk from a large mound sitting out in the open. The spice merchant would scoop off a glob onto a piece of wax paper. I usually could not wait to spread it thickly on fresh flatbread with nigella seeds, another one of my favorites. When I told my aunt that I bought harissa in bulk at the market, she was appalled. I never got sick. It will be a while before the chili peppers are ready but I already have my harissa recipe lined up. Unfortunately I don’t have my Tunisian grandmother’s recipe. This is as close to hers, and other genuine harissa berbère, as I could get it. Basically you can use any red chili peppers you like. The more seeds you remove, the milder the harissa will be. I usually remove most of the seeds. Wear disposable gloves when handling the chilis. Harissa keeps for several weeks in the fridge. 1. Remove the stems from the peppers. Cut them in half and remove all or some of the seeds. Put the peppers in a small heatproof bowl. Pour boiling water over them, just enough to cover. Press the peppers into the water and soak for a few minutes. 2. In the meantime heat 1 tablespoon olive oil in a small skillet. Add the garlic and spices and cook over medium heat until fragrant. Stir often and make sure the garlic does not brown. Remove from the heat and let cool. 3. Drain the chilis and place them in the food processor with all the other ingredients. Process in a food processor or blender to a coarse or fine consistency according to taste. Season with salt and fill in a sterilized glass jar. Smoothen the top and pour additional olive oil over it to prevent harissa from drying out, and refrigerate. That is a really good idea. Can you do this technique with other types of vegetables and fruits? I am initially thinking whether tomatoes would be viable with this method?